In case you haven’t heard, yesterday Yogi Berra passed away at the age of ninety years old. One of the most famous baseball players, Berra played his entire career as a catcher and outfielder for the New York Yankees and after retiring, was elected to the Hall of Fame in 1972. 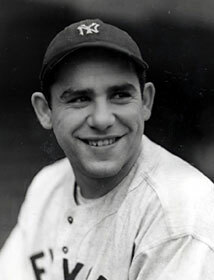 Besides being an incredible player, Berra served in the U.S. Navy during World War II and became a well-known personality far beyond the game of baseball. What a tribute! And what a reminder of how important good character, a character of “sincerity and kindness” truly is. Every one of us live a life on and off camera. That is, whether we are a a school teacher, an electrician, a police officer, or even a preacher like I am, there are those moments when we are “on the clock” but a true test of our character is how we treat people when there aren’t any spectators. Be a nice person, be kind and sincere with everyone… Love our neighbors as ourselves because the world is a better place when we do! This entry was posted in Contemporary Culture, Leadership and tagged Baseball, Derek Jeter, Love, Yogi Berra. Bookmark the permalink.